When my blogging friend Emma dropped me a message a few weeks ago asking if I would be interested in attending a chocolate workshop with her, it didn’t take me long to reply back with a big YES PLEASE!! 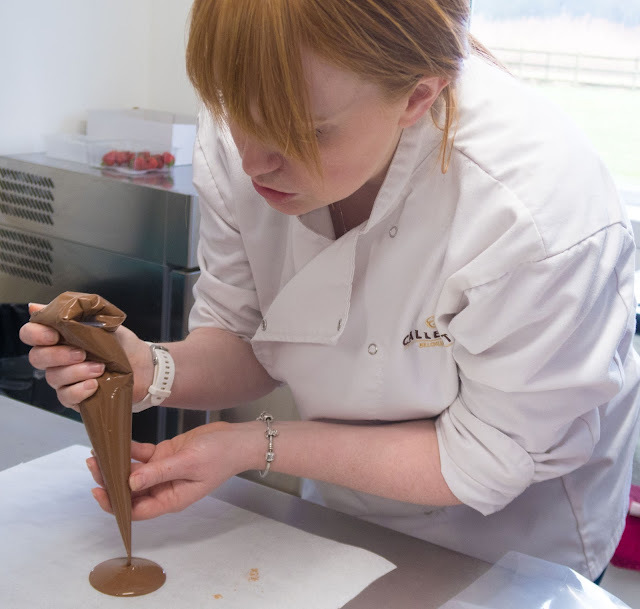 So last Saturday, my Mum and I made our way over to Hurst, near Reading, to the Chocolates for Chocoholics workshops. 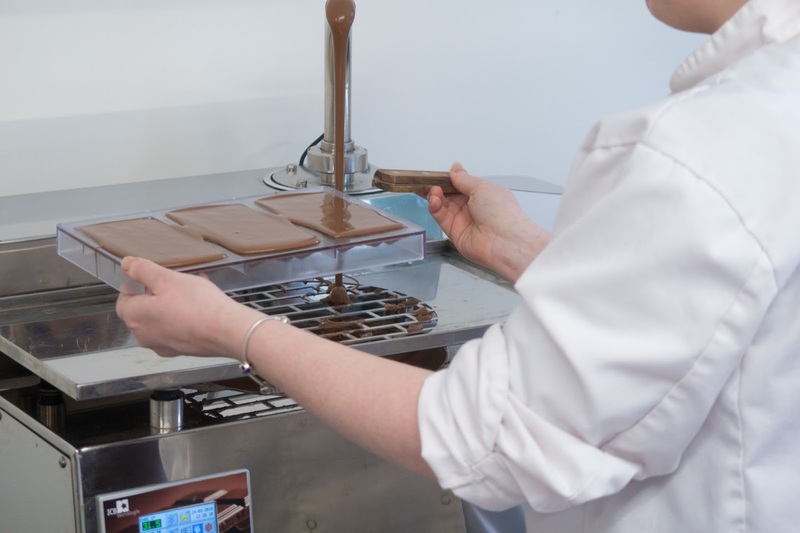 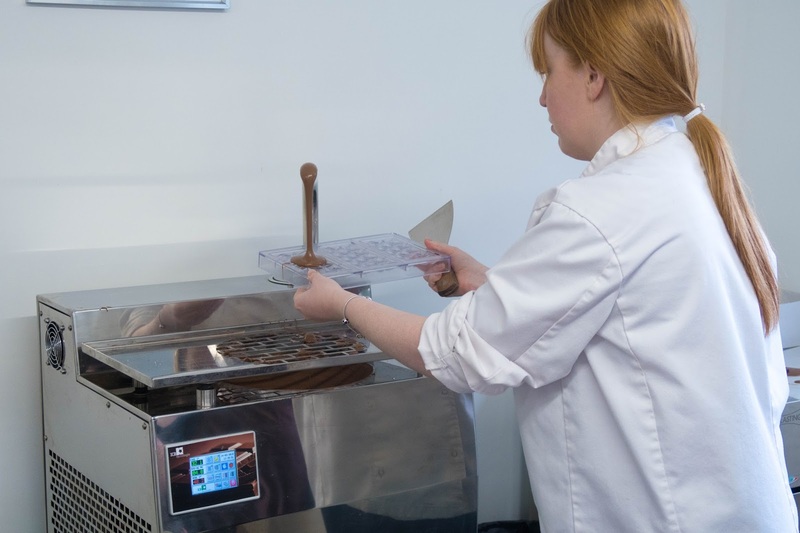 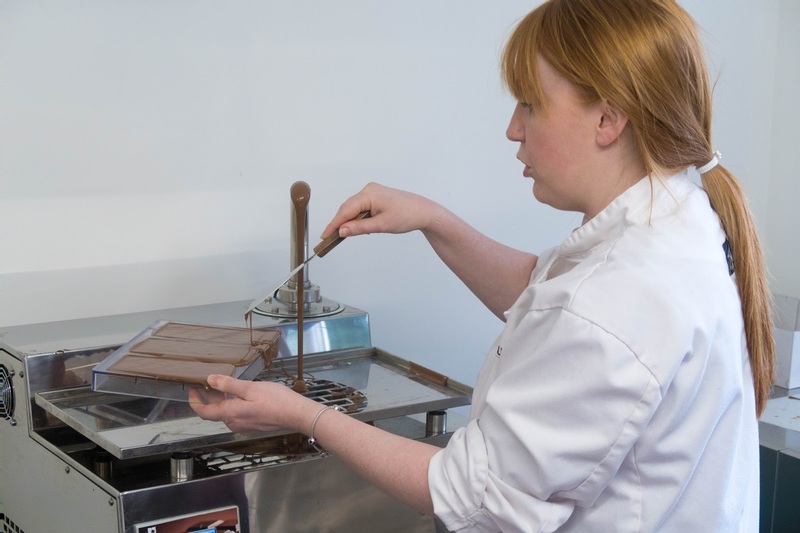 Emma’s family started the business in 1986 when her parents decided to leave their safe, salaried jobs to follow their dreams and start importing and selling luxury chocolates from a variety of specialist chocolatiers in Europe. 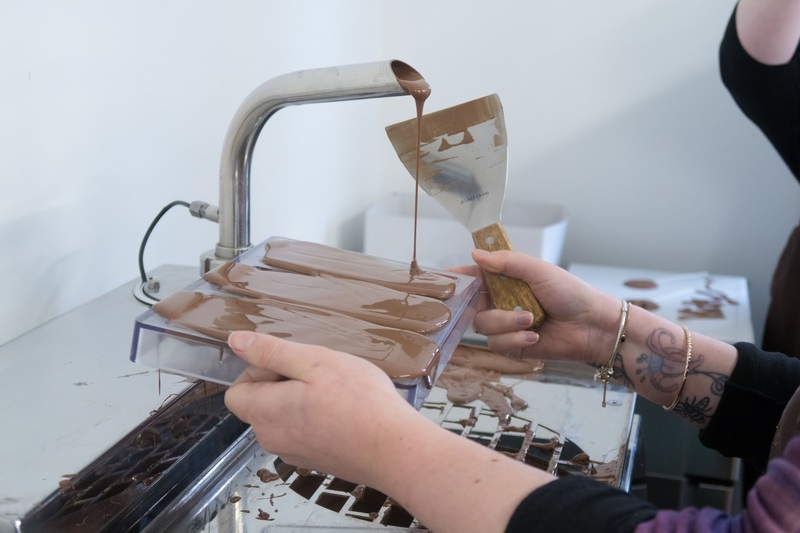 Their business has continued to grow and they now employ Emma’s sister, Vicky, as well as running chocolate parties and workshops, much like the one we had arrived to try out. 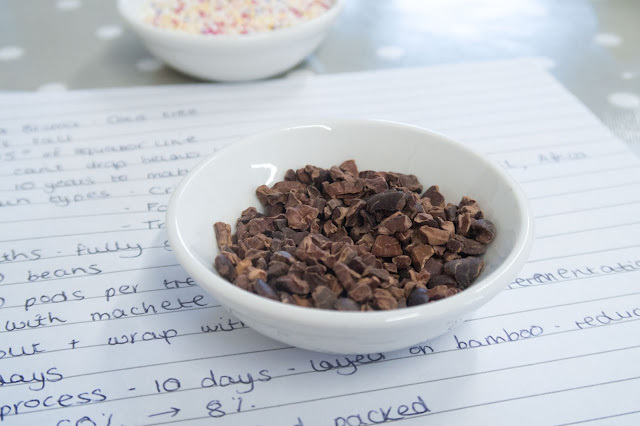 When we arrived, we were shown into one of their workshop rooms and sat around a table covered in various sprinkles, sweets and tools. 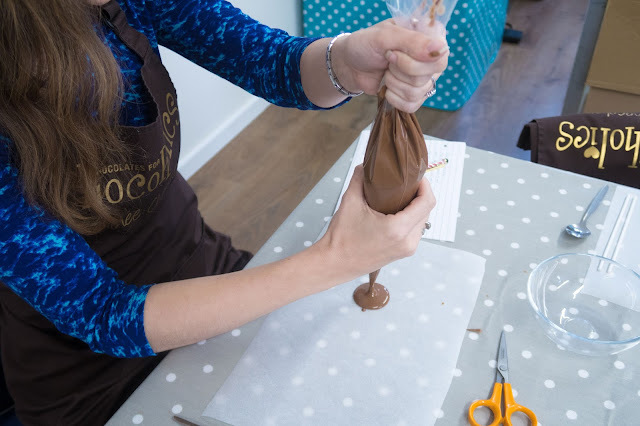 We all put our special Chocoholics aprons on (believe me, you need an apron and sleeves you can roll up – things can get rather messy!) 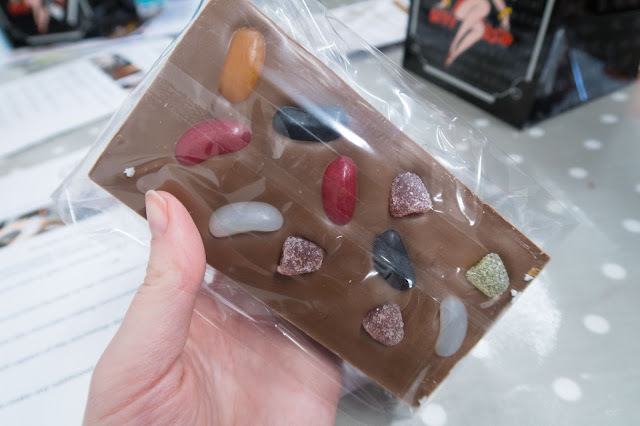 and were offered a drink. 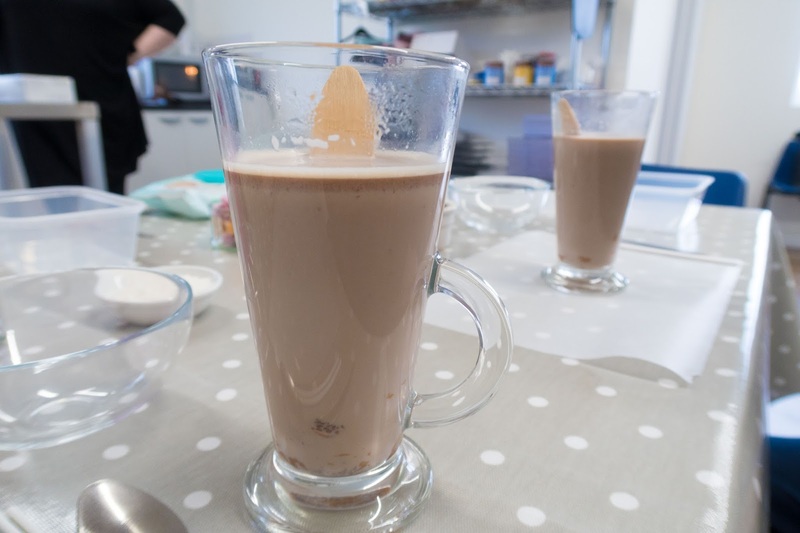 We all opted for one of their special hot chocolates – you get hot milk and a chocolate stick, which then gradually melts into the milk and oh my goodness did it taste good. 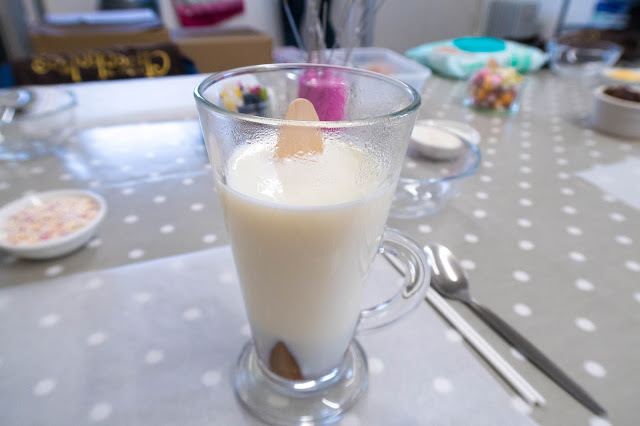 I rarely drink milk because of my digestive problems but it was a cold, rainy day and I couldn’t resist a hot chocolatey drink. 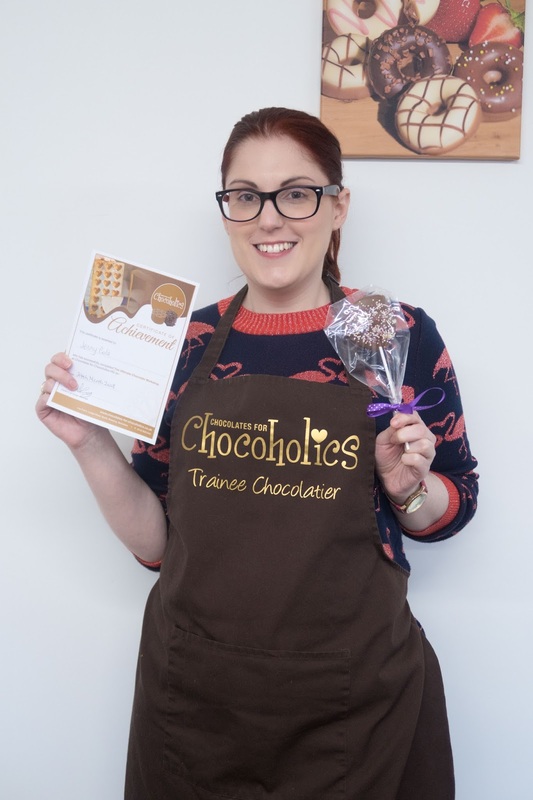 Once everyone had arrived, Vicky and Emma introduced themselves and told us a bit about the Chocolates for Chocoholics business. 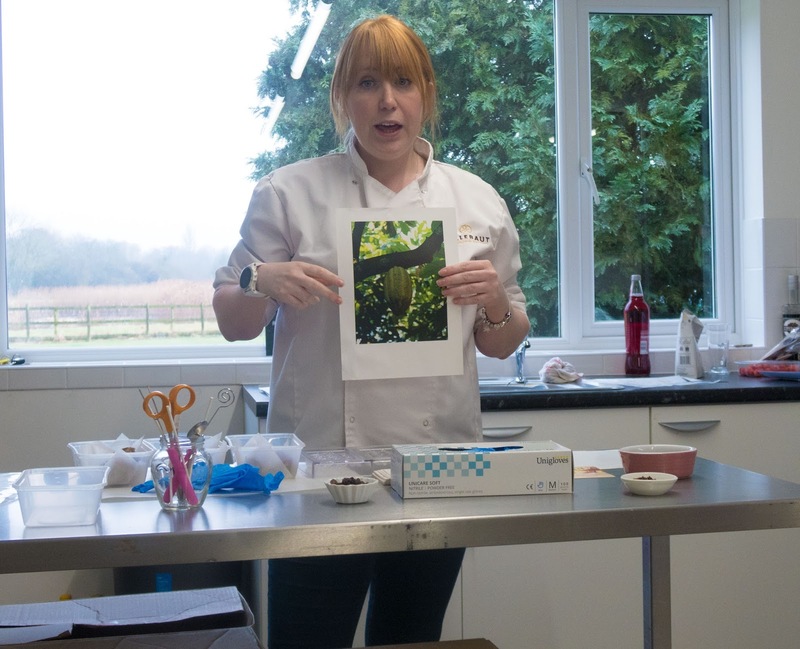 Vicky then gave us all a piece of paper and a pen, and began to tell us a bit about the process of how chocolate goes from bean to bar. We had to take notes for a little quiz later on, so were all scribbling fiercely while Vicky talked us through some of the facts (which were really interesting – it was good to understand how our chocolate is actually made). 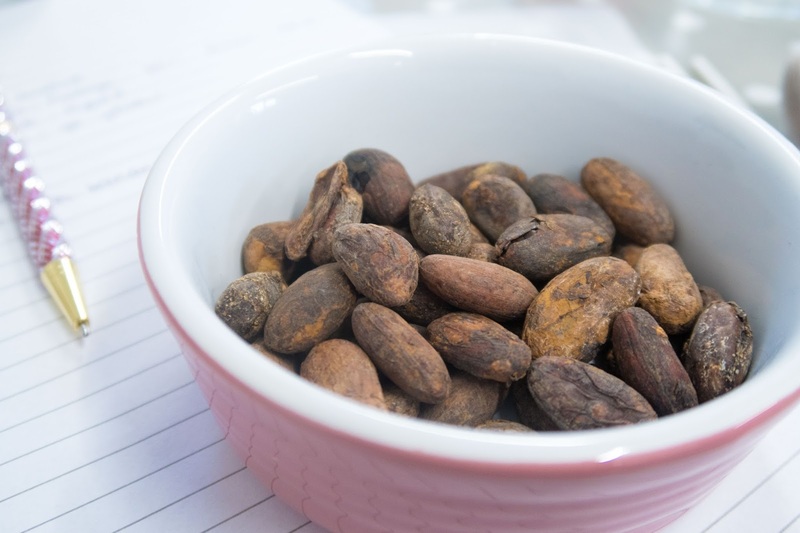 She also passed round some bowls of cocoa beans, cocoa nibs (which were much more bitter than I expected!) and some caramel chocolate buttons, which tasted much better! 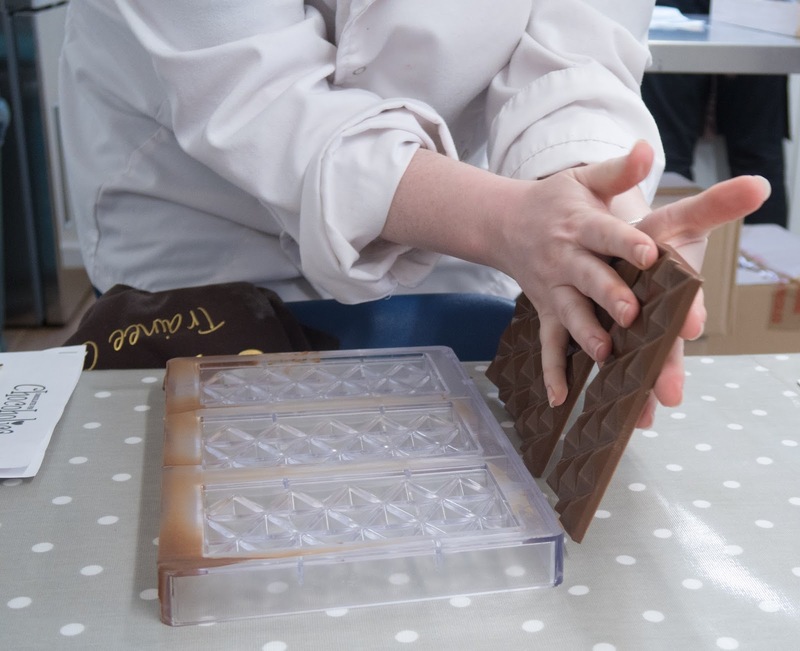 Once Vicky had finished the talk, we were each given a piece of ganache (which had been pre-made for us). 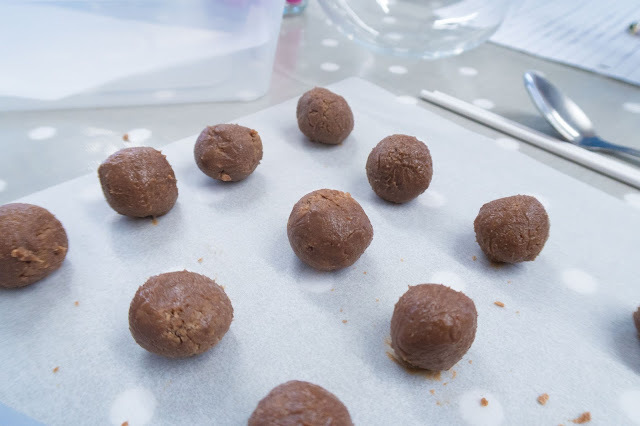 We had to break it into smaller pieces and then roll each piece into a truffle-sized ball, which we placed on baking sheets. 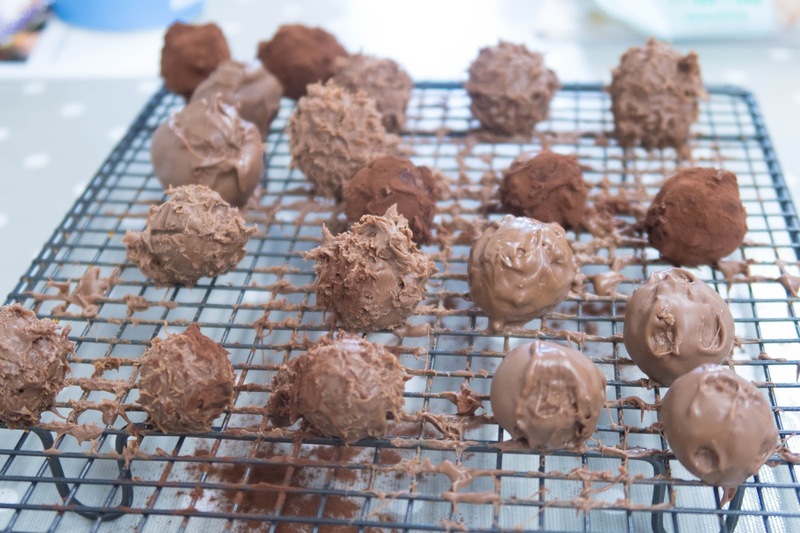 These were put in the fridge to cool, as rolling the balls started the melting process and they needed to be solid for the next step. 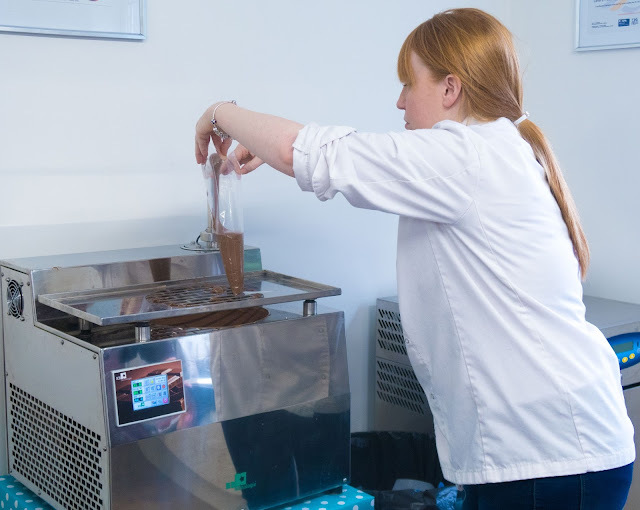 While our truffles were cooling, Vicky then introduced us to the star of the show – the chocolate machine! 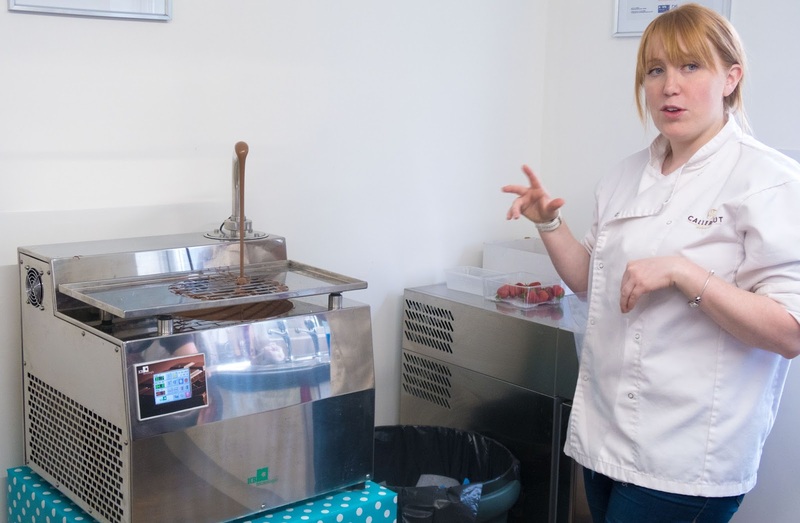 As you can see, there is a constant stream of melted chocolate pouring out of the tap – it was seriously tempting to stick your finger (or your face, in the style of the Vicar of Dibley) in it! 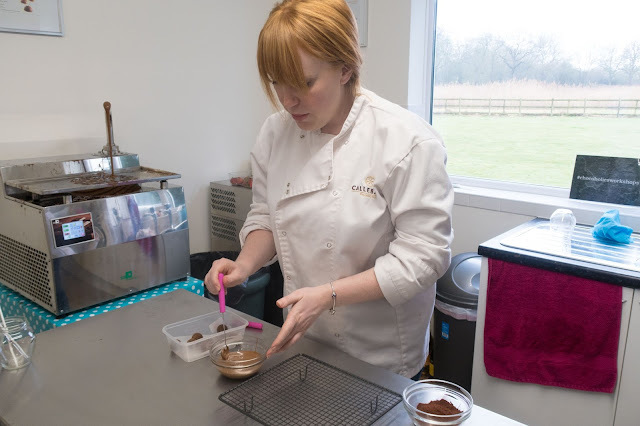 A piping bag was filled with melted chocolate, and Vicky demonstrated how to hold the bag to pipe the perfect chocolate lolly shape. 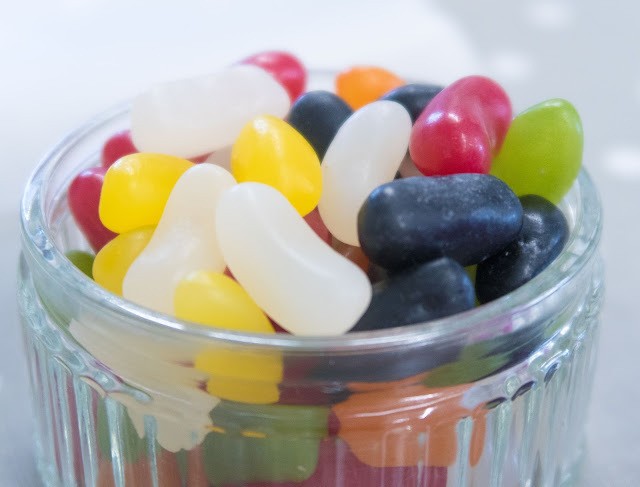 Then it was our turn to pipe two lollies and our name. The other girls did really well when it came to piping their names, but mine wasn’t quite so sleek! Still, it tasted nice at the end! 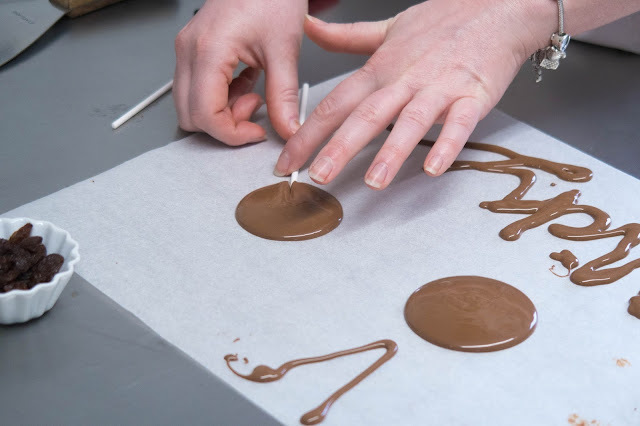 We had to add a stick to each chocolate disc before it solidified, and then we were then able to add flavour/decoration to our lollies. I decided on rainbow sprinkles for one, and a rather unusual combination of desiccated coconut and salted caramel for the other. 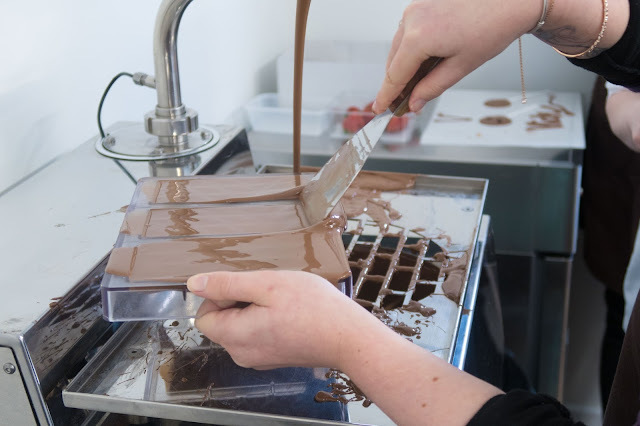 Still, I bet it will taste good, and flavour experimentation is how all these new chocolate bars are invented! 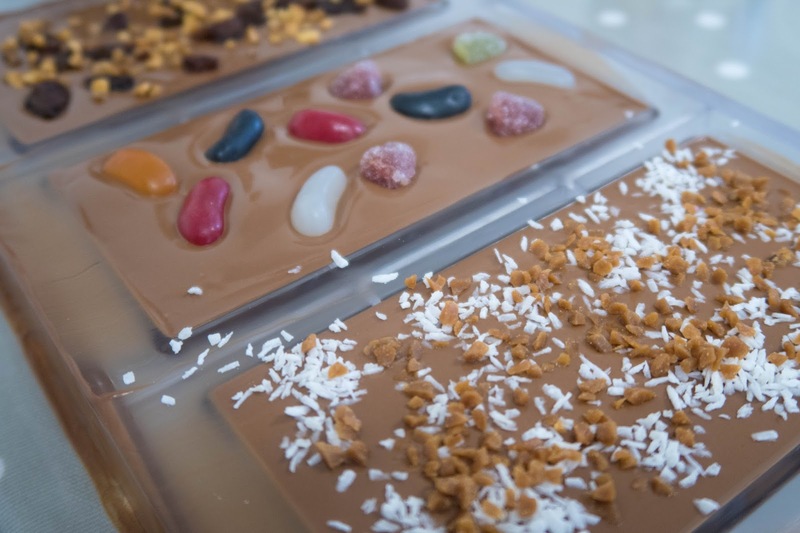 Our lollies then went off to the fridge to set, and we moved onto our next job – bars of chocolate. Vicky started by showing us how to fill the moulds, tap the air out and scrape away any excess chocolate, and then it was our turn to have a go. 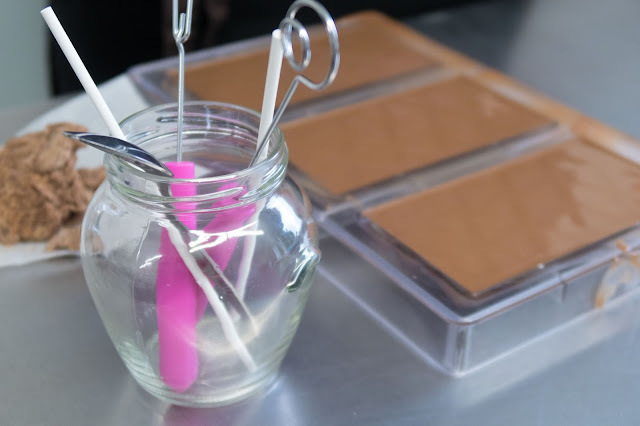 This is where things get messy! 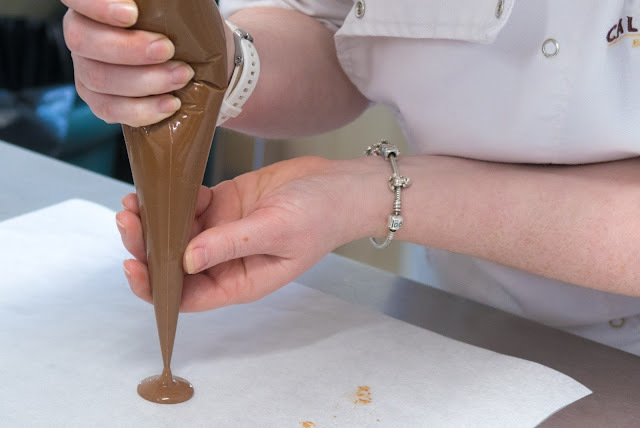 We all ended up with chocolate all over our hands (and arms!) 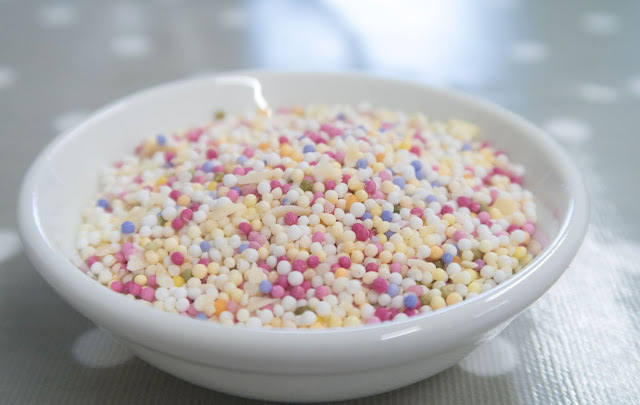 but believe me, that wasn’t a problem! 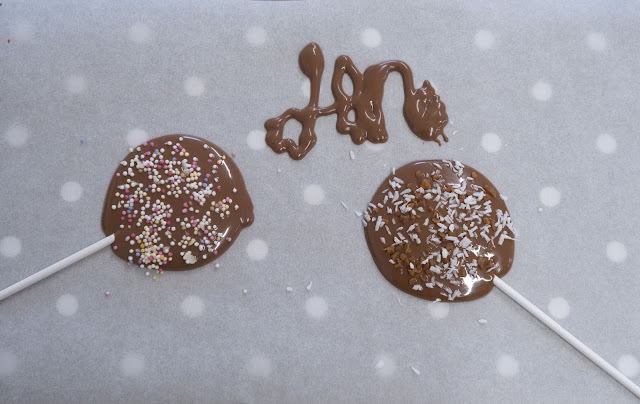 Once the moulds were filled with chocolate, we went back to our table and added some decoration. 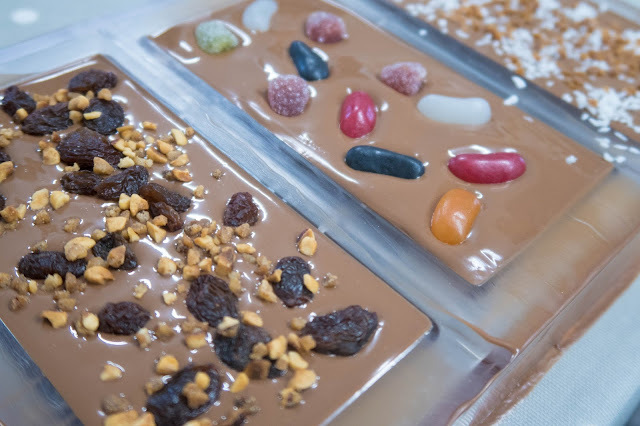 I decided on fruit and nut for my first one, jelly sweets for the second and my favourite new combination of desiccated coconut and salted caramel for my third. Our bars then headed to the fridge to cool. 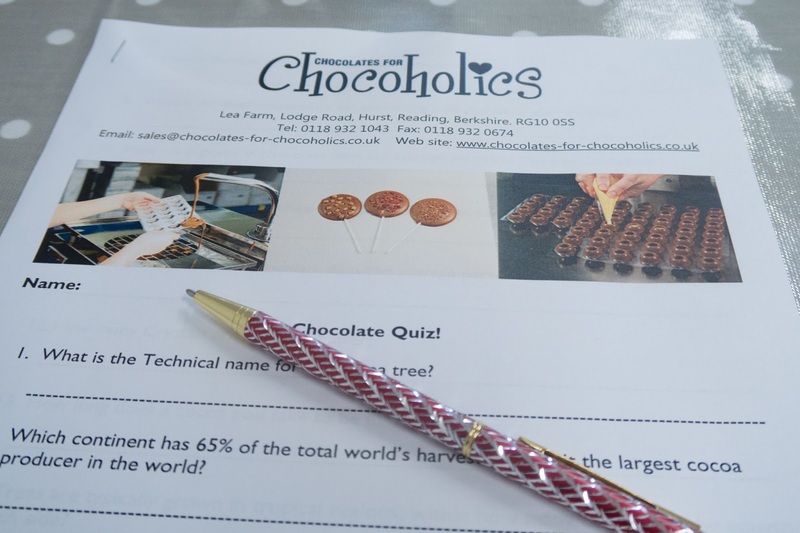 While our chocolates were cooling in the fridge, it was time for us to take part in a quiz. 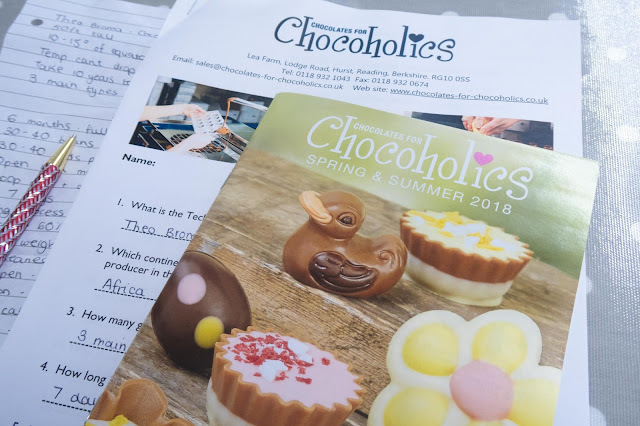 Vicky handed out the quiz sheets, offered us more drinks and we got to work on filling in the answers (we were, thankfully, allowed to use the notes we made earlier!) 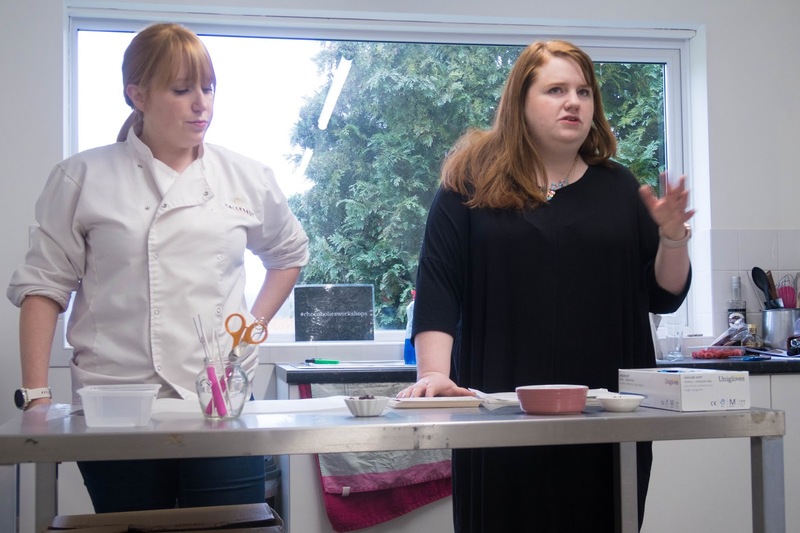 Once everyone had finished writing, Vicky and Emma went through the answers and we marked each other’s papers. 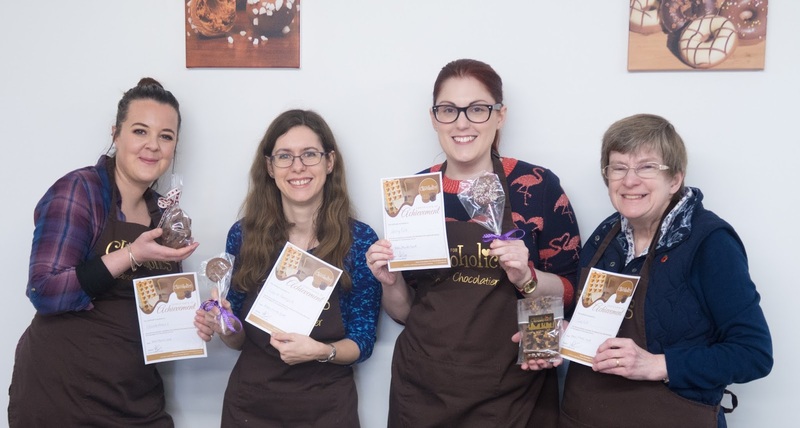 By some amazing fluke, three out of four of us all got the same score, so were all offered a prize. 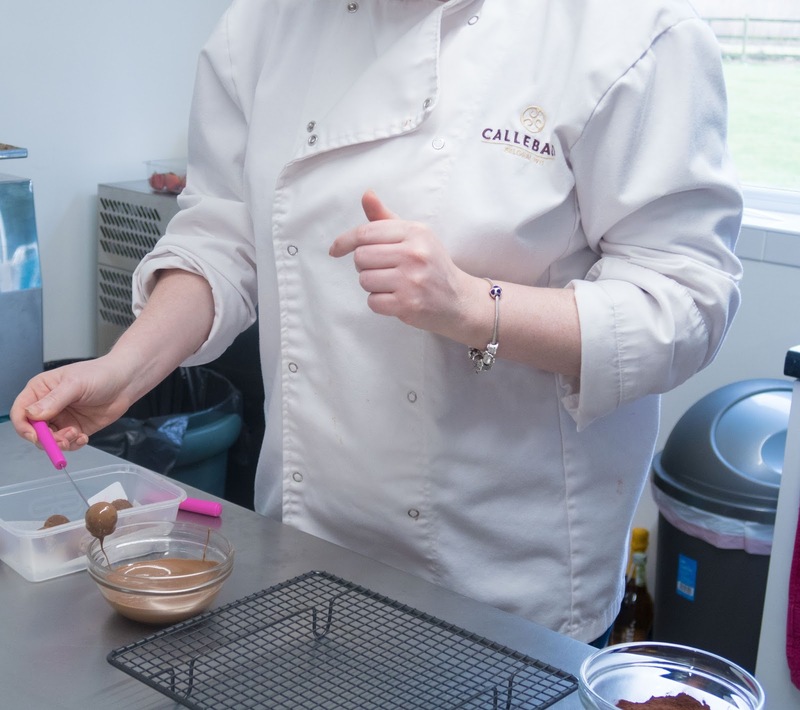 I went for these rather yummy looking Cherry Trifle Cups, which I’m very excited to sample. Then it was back to the truffles. We watched Vicky demonstrating how to coat the ganache in two layers of melted chocolate and then were shown a variety of finishes to choose from (including one called ‘hedgehogging’, which was my personal favourite!) 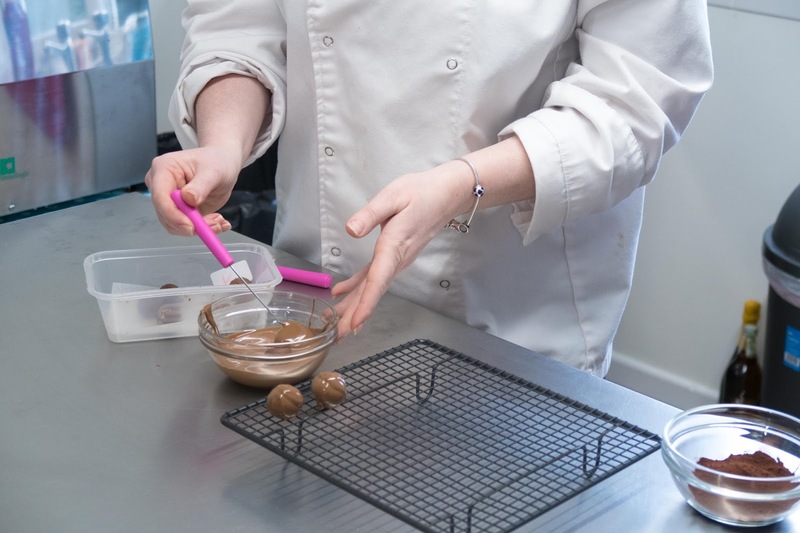 We all then got on with doing our own truffles and, if I do say so myself, they turned out looking pretty darn good! 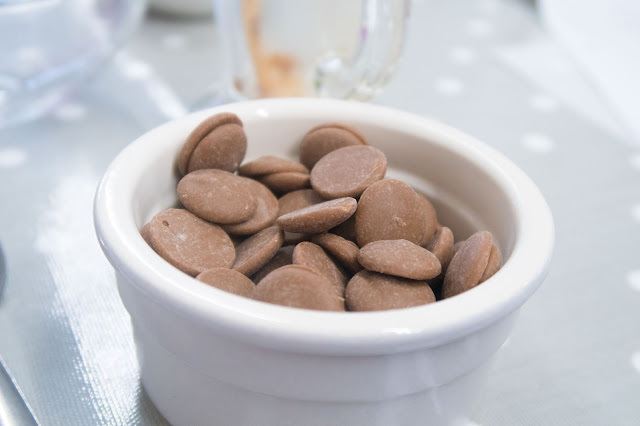 The best part was, because we had handled the chocolate in our bowl, it couldn’t be re-used, so we had to eat it! 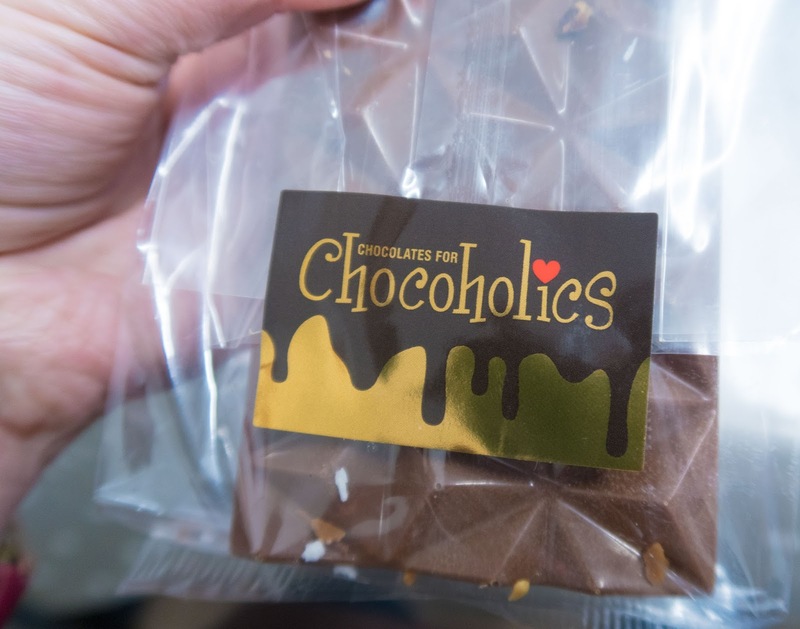 Once all of our creations were ready, we were given a variety of cellophane bags, ribbons and stickers to package them up in. 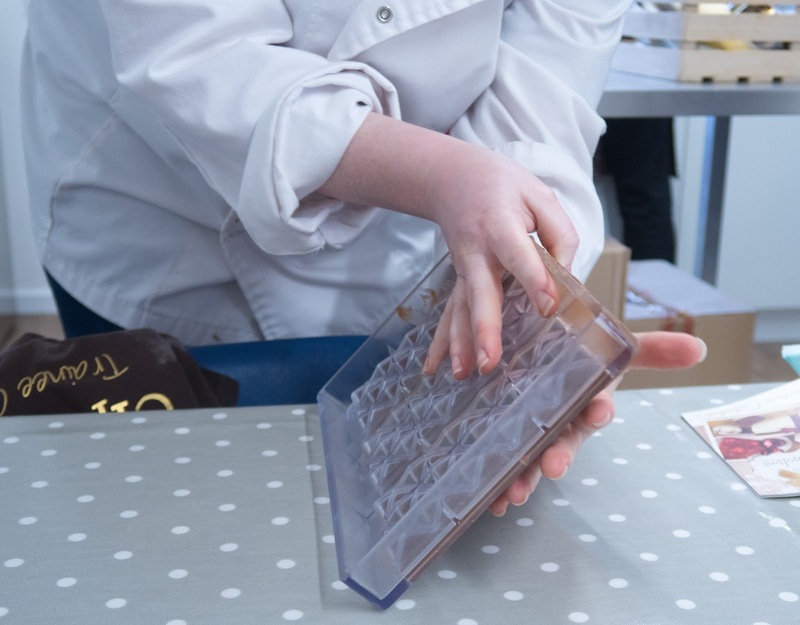 Everyone’s chocolates looked very professional – much like those you might find in a posh chocolate shop. 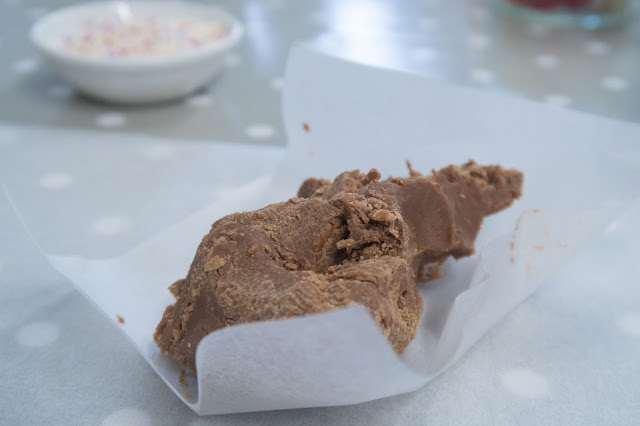 I was really impressed with the amount of chocolate products we were able to create in one morning! 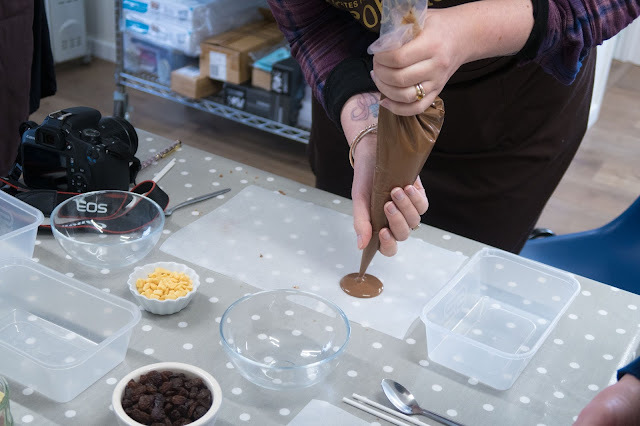 Throughout the workshop, my Mum and I both kept saying how good they would be for something like a Hen Party, Baby Shower or Birthday party. We will definitely be remembering them for future party ideas and will be recommending them to friends too. 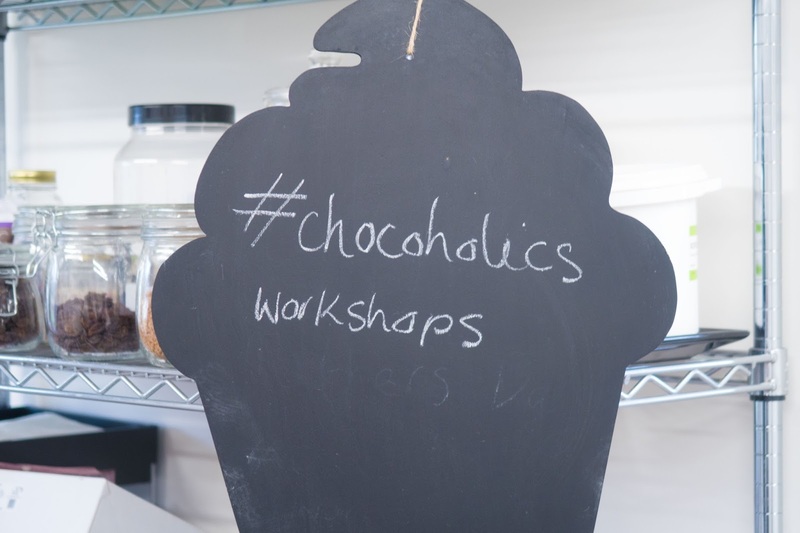 I really hope you’ve enjoyed hearing about our time with the Chocolates for Chocoholics ladies – I’d love to hear if you decide to go to a workshop in the future, or if you buy any chocolates from their website. 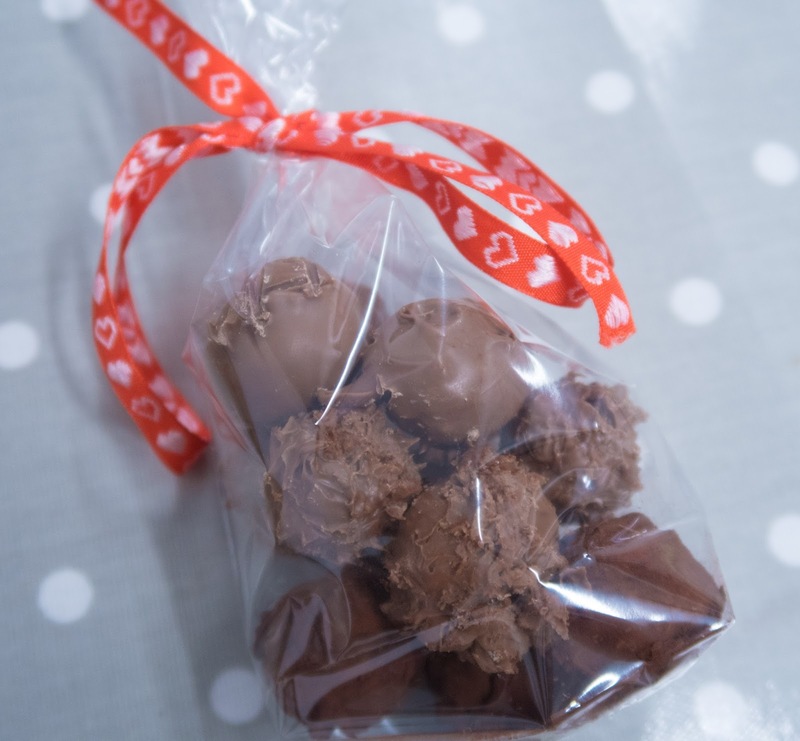 Oh, and I should probably add – the chocolates that we made were flippin’ delicious! 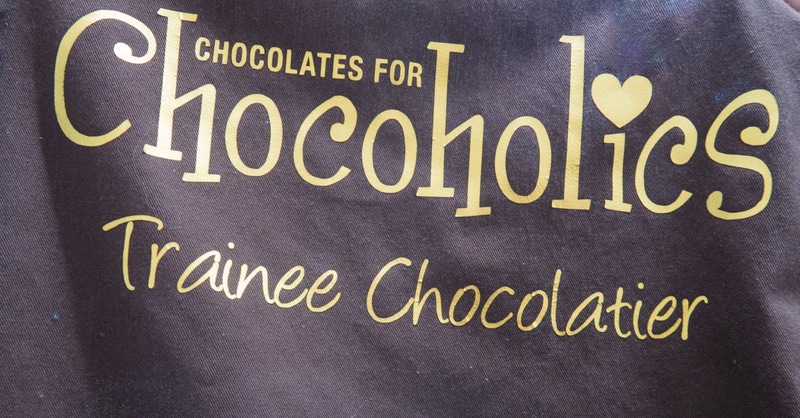 Are you a chocoholic like I am? 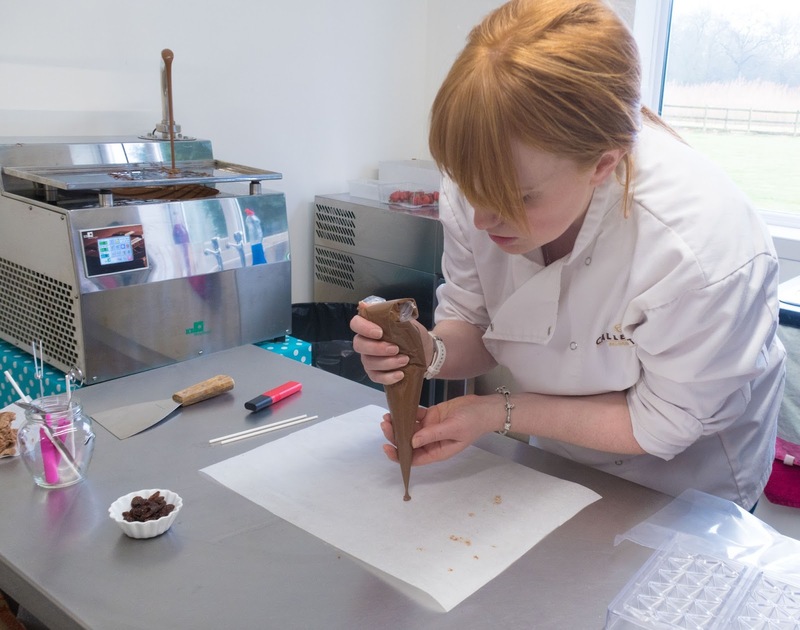 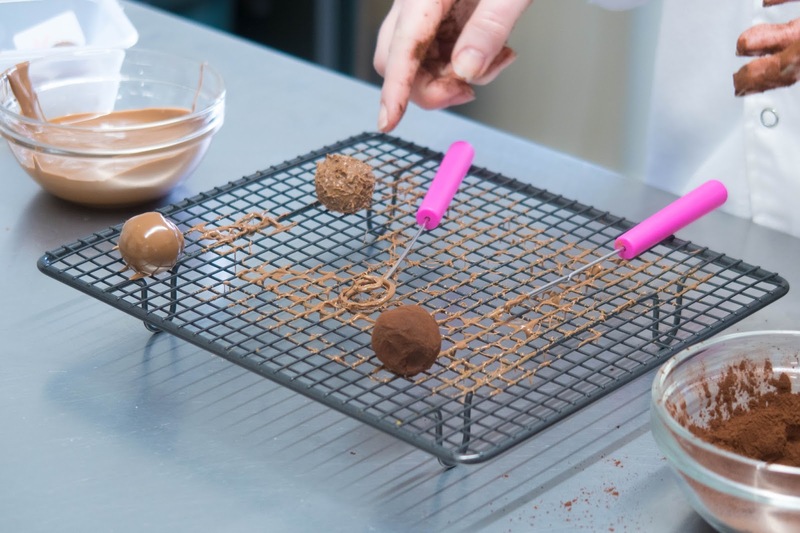 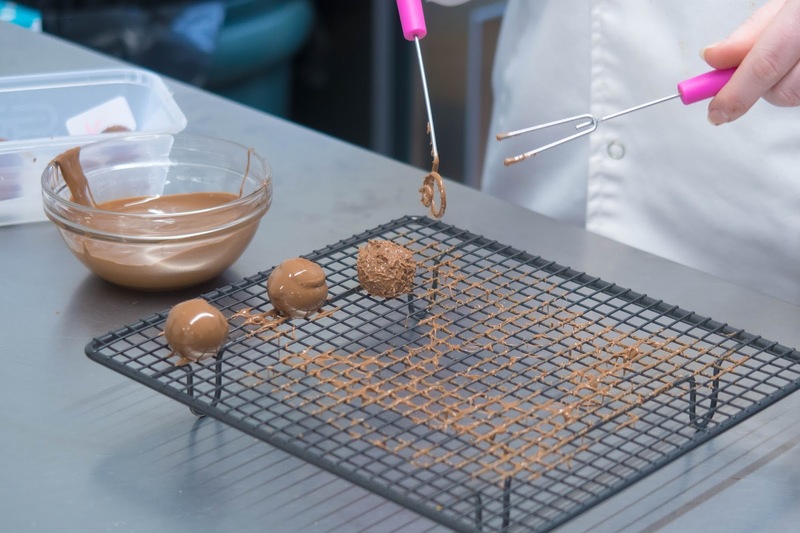 What do you think of the chocolate workshops they run? *Chocolates for Chocoholics kindly provided the workshop to me at no cost, for review purposes. 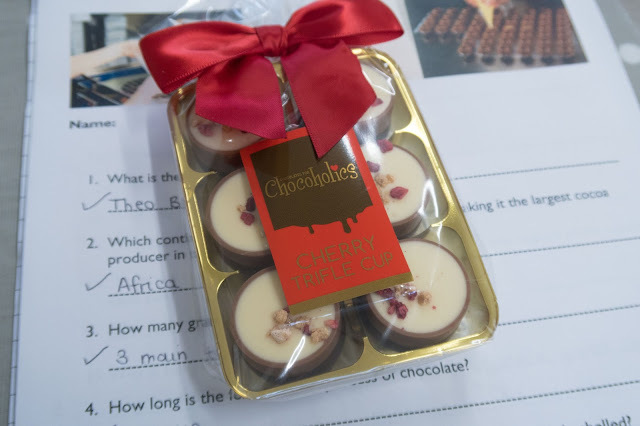 However, all opinions are very much my own and the chocolates were really tasty!